Dubbing the BJP as the "biggest Non-Performing Authority" of India, the Congress on Friday said the central government led by Prime Minister Narendra Modi is relying on statistics to create an illusion of economic growth.The opposition party also slammed Union Finance Minister Arun Jaitley's statement on GDP figures, saying it was "full of utter confusion, hypocrisy, and bemusement. ""Unemployment has risen and the corporate sector has taken a hit, but the Modi government is relying on statistics to create an illusion of economic growth," Congress Spokesperson Abhishek Manu Singhvi said here.The Congress leader said that Jaitley's replies to the media on Thursday were full of "utter confusion, perplexity, hypocrisy, bewilderment, and even bemusement". "He (Jaitley) could not answer the basic questions. He said 'demonetisation cannot be identified as the sole reason for low Gross Domestic Product growth' and said 'sometimes 7-8 per cent is a reasonable area of growth'. "He also blamed global factors for the government's economic mismanagement. 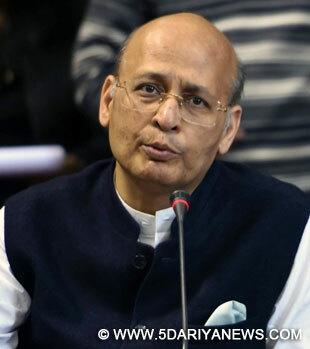 In the past thee years, the government does not have the faintest idea of how to stop the economy's downslide," Singhvi said.He said: "The recent GDP numbers conclusively prove that the Bharatiya Janata Party-led government is responsible for this massive downslide. "The BJP has become the biggest NPA (Non-Performing Authority) of India. Only 24 months are left (for the 2019 general elections) to take some tangible and real steps of governance. "The Congress demanded that the BJP implement its poll promises on creation of jobs and welfare of farmers.Singhvi said Congress Vice-President Rahul Gandhi on Thursday questioned Modi on his vision about 'Make in India'. The Congress leader also reflected on the state of the distressed farmers across the country, he said. "Figures on the manufacturing sector made public are at a three-month low. In fact, since the BJP has come to power (in May 2014), the Index of Industrial Production has always seen a downward trend," said Singhvi.